The Eastern Tiger Swallowtail, or Papilio glaucus, is the state butterfly of South Carolina. This symbol was adopted in 1994 with the approval of Act 319 of the South Carolina General Assembly. Butterflies have four wings – two larger sections called fore wings, and two smaller sections called hind wings. Swallowtails are named for the long portion of their hind wings which resemble a swallow's tail feathers. Each of the fore wings of the Eastern Tiger Swallowtail has four black stripes resembling a tiger. Males are yellow with black stripes, while females can be either yellow or dark gray with the same striped pattern. Often males will have a small portion of vivid color, but females always have orange and blue spots on the lower edge of the hind wing. 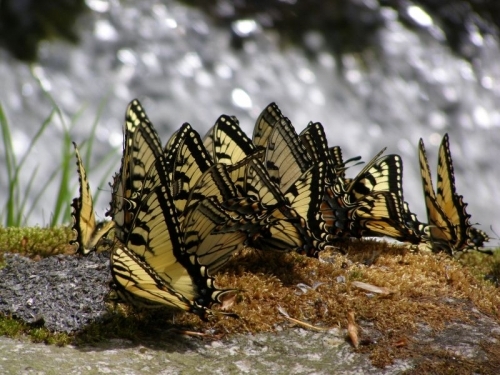 The female Eastern Tiger Swallowtail can produce up to three "broods" each year. They do this by laying small, round eggs on the upper leaves of host trees such as Poplar, Black Willow, Red Maple, or Elm. When the egg hatches, the larva (or caterpillar) eats the egg's shell, then dines on the leaves of the plant or tree on which it hatched. Over the course of weeks, the larva grows to about two inches long and molts several times. At first, the larva resembles bird "poop" in order to ward off predators such as birds and raccoons. When it is plump and green, the caterpillar develops two "eyespots" – yellow spots with black centers which resemble eyes. Eyespots help protect them from potential predators. During the next stage, the larva turns into a pupa by wrapping itself into a leaf and securing it with silk. At this stage, the pupa is called a chrysalis, and it neither eats nor drinks while inside its cocoon. Over the next several weeks, it will transform into a butterfly and emerge ready to take flight. Butterflies do not eat solid foods as they did in their larval stage. Instead, they sip nectar from a variety of flowers using a proboscis – a long, tube-shaped tongue. Such flowers include honeysuckle, lilac, and black-eyed susans among others. The entire process of development – from egg to butterfly – only takes a about a month! Adult Eastern Tiger Swallowtails are considered large, with a wingspan between three and six inches. AN ACT TO AMEND THE CODE OF LAWS OF SOUTH CAROLINA, 1976, BY ADDING SECTION 1-1-647 SO AS TO DESIGNATE THE TIGER SWALLOWTAIL AS THE OFFICIAL STATE BUTTERFLY. "Section 1-1-647. The tiger swallowtail is designated as the official state butterfly." Approved the 29th day of March, 1994.